No matter how well installed your roof might be, every roof will eventually need replacement. Often roof replacement is needed due to age and natural wear and tear. However, large storms can cause serious damage that requires a roof replacement and even relatively minor damage to an old roof might best be fixed with a roof replacement. Our expert team is here to help. As the local roof replacement contractor of Southern Michigan, we can thoroughly inspect your roof and help determine whether a roof replacement is necessary or not. If you do need a new roof then we can help guide you through the process and make sure you get the best materials. We offer a wide range of customization options so your new roof can be a major upgrade for your home. Do you need a trusted roofing contractor for a roof replacement? Contact us today online or at 1-844-329-3277 to schedule your free roof replacement cost estimate in Kentwood, Wyoming, Grand Rapids, and throughout nearby Michigan and Illinois! Dark streaks on an asphalt roof. 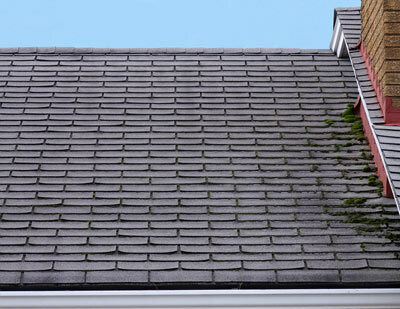 Algae & moss growth on the roof not only looks bad, it can also lead to roof damage. If your roof is old or you've noticed signs of a roof problem, we can assess your roof to determine if it's time for a re-roof and provide you with a free estimate for replacement or the services you need. The first instinct of most homeowners is to choose roof repair over roof replacement. 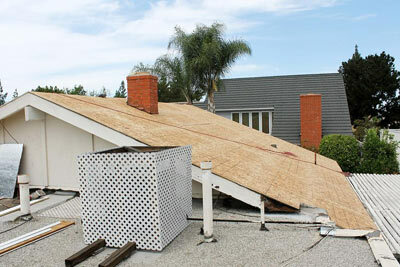 After all, a roof replacement is almost always more expensive initially. Sometimes this makes perfect sense and is the best option. However, this is not always the case. Replacement shingles may not match the existing roof decreasing your curb appeal, partial reroofing can cost more than replacement in the long term, and multi-layer roofs will often need to be stripped for partial re-roofing or repairs. On older roof's repairs may simply prove ineffective as new problems continue to crop up. In these cases, we always suggest a brand new roof installation. While asphalt shingles can be installed over already existing asphalt shingles, such replacements may not address core issues like water-damaged sheathing. By fully replacing the roof you address the problem at the source and often end up paying less in the long term since your brand new roof will last far longer than haphazard repairs or incomplete/partial roof replacements. Ready to schedule your free roofing cost estimate? Looking for a roofing contractor you can trust to help you decide if a roof replacement is right for you? Infinity Home Improvement has the expert roofers that you need. Contact us today to schedule your free roof replacement cost estimate in Kentwood, Wyoming, Grand Rapids, Holland, Walkerville, Rockford, Allendale, Lansing, Kalamazoo, Battle Creek, and throughout nearby Michigan and Illinois!